Stourport was defended by the 11th Worcestershire (Stourport) Battalion, commanded (in 1941 and later) by Lt-Col. J.A.D. Perrins, M.C. One of the members of this Battalion was Sgt. Charles Henry Burton seen here (right) in uniform and standing on the car park at the rear of his home in Lombard Street, Stourport-on-Severn. There is so far little surviving information concerning Charles Burton's Home Guard service. What is very likely however is that, bearing in mind his previous military experience and eagerness to serve, he would have been a very early volunteer and would have served right through to the stand-down of the service at the beginning of December 1944. It is also likely that his previous service would have been seen as invaluable at the formation of the Home Guard in May/June 1940 and would have led to his immediate appointment to N.C.O. rank. There was of course much more to Charles Burton as a man and as a soldier. His son has written an excellent resumé of his life. Whilst not all of it is, strictly speaking, of direct relevance to his four-and-half years of Home Guard service, it is nevertheless a useful picture of the man who is being commemorated on this page; and also of the remarkable extent of military experience and professionalism brought to the Home Guard by him and by so many men of his generation. My father, Charles (known as Charlie), was born at 12 Cheapside, Stourport on 12th March 1897 the second youngest of twelve surviving children. (The area is seen below right). He attended Stourport Boys School and received medals for unbroken attendance during 1903-1905 and 1906-1907 and a book prize for Sunday School attendance in 1910. His mother died when he was thirteen and he was effectively brought up and indeed, dominated, by his seven sisters. He took the first opportunity to leave home, joining the army, aged 16, four years later. He never forgave his sisters for what he saw as a harsh home regime and we had very little to do with most of them in later life. The boyhood experience seems to have affected him by making him withdraw into his own world, not particularly needing the company of others. In the 1911 census Charlie was described as an under-gardener, presumably his first job. However he spent the rest of his working life with the local tannery of Henry Beakbane. In 1914 he was a belt maker before volunteering for Army service. His war service is described in detail below. Charlie Burton attested for the army at Stourport on 11th February 1914, joining the 7th Battalion, Worcestershire Regiment. The next two years he spent training whilst awaiting the age of 19 and being allowed to fight. He finally sailed for France to join the war with the 1st Battalion of the Worcesters, from Southampton, in February 1916. When he joined the Battalion it was near the mining village of Bruay in the Nord Pas de Calais region, north-west of Arras. Until late June he was alternately in the trenches or in reserve billets in this region. Then in the last week of June the Battalion moved south to join the concentration on the Somme. Luckily they were in reserve billets in Raineville on 1st July when the British Army suffered massive casualties on the first day of the battle. On 7th July the battalion joined the attack on Contalmaison. After fierce fighting, involving many attacks and counter attacks, the enemy was eventually driven out of the village. The battalion lost nearly 350 men of all ranks. A few days later the Battalion went north by train to Bethune and for the next three months were in and out of the line near Cuinchy. some 8 km to the east. Then, in mid October they went by train back to the battlefields of the Somme. After detraining they made their way to trenches near Gueudecourt where they were shelled incessantly. However British barrages enabled them to make a small advance. They carried on moving in and out of the line around Carnoy until the end of the year. In the New Year the 1st Worcs moved up to the heights above the Somme moving into trenches east of Bouchavesnes from where they were to launch an attack. On 4th March the attack took place as the Britsh artillery opened up a barrage and all along the line the troops swarmed out of the trenches. The attack was immediately successful and the trenches on the Epehy ridge were secured. During April and May the Battalion went into new positions near Gouzeaucourt and Honnecourt before retiring to Moislains for training. After more than a year in the trenches Dad developed trench foot in May 1917 and went into hospital in Rouen to recover for a couple of months. After 10 days leave in the UK he was posted back to the 10th Worcesters in September. He joined the Battalion at Corruna Camp near Westoutre and three days later went to the battle area (Battle of the Menin Road Ridge near Ypres). At dawn on 20 September the British battalions advanced and were completely successful and captured ground was quickly entrenched. Losses to the battalion totalled 150. Two days later the Battalion settled down in Fermoy Camp at Locre for a well earned rest. They moved back into the salient on 26 September and moved up to forward positions on 1st October. Three days later, at dawn, an attack (Battle of Broodseinde) began with the artillery opening fire and the troops pushing forward to assault. Unfortunately they only gained a few yards of ground and during the action Dad was wounded in the right knee by a piece of shrapnel. He was then repatriated spending 33 days in hospital. After about 4 months recuperating at the Command Depot in Ballyvonare, County Cork he was sent back to France in March 1918. He joined the 1st Battalion of the Worcesters on 9th April whilst it was lying at Soyes east of Amiens. By 19th April the Battalion was in trenches on the southern outskirts of Villers Brettonneux. The Germans launched a bombardment early on the 24th and followed with an assault by tanks and infantry. The Worcesters put up a gallant struggle but were overrun until aided by British tanks (the first duel between tanks that ever took place). The next day a counter attack was launched and by midday the enemy had been driven out of the village (The Action of Villers Bretonneux). On May 3rd and 4th the Battalion was transported by train from Saleux to Fismes and by the 11th moved into the front line in trenches facing Juvincourt. After a few days in the trenches and a few days training they were back in the front line by 24th. Two days later it was sensed the enemy was preparing for action and battle stations were manned. On 27th the Germans commenced the last phase of their great gamble for victory. Following a heavy bombardment of the British trenches north of the River Aisne enemy tanks and artillery advanced in thick mist. In short time the Battalion was surrounded and attacked in front, flank and rear and only a few stragglers got back (Battle of the Aisne). Dad suffered gassing due to a shell and was captured by the enemy. This was confirmed by a postcard to his parents in August saying, however, that he was well. After the end of the war he apparently returned from France in December 1918 and was eventually disembodied at Warwick in April 1919. After demobilisation in April 1919 Dad married my mother, Doris May Tipper, at Stourport Church in February 1920 and soon afterwards my sister, Eileen, was born. They all lived in a cottage in Severnside, Stourport with my grandmother, Dorcas Birch, and her aunt, Charlotte Whitmore, together with mom’s sister, Freda. Privacy and space must have been at a premium which perhaps explains the lack of further children until I was born. The cottage was only the width of a path from the water of the River Severn. Dad had returned to Beakbane's after the War and was by then working as a dyer of leather, a job which continued for many years - right up until 1964 when the tannery burned down and he moved to Beakbane’s manufactory near Kidderminster, where he was employed cutting out leather for bellows. 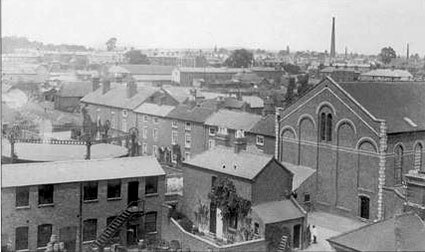 In about 1933 Mom and Dad moved into a rented house in Lombard Street, Stourport very close to the tannery where Dad worked. 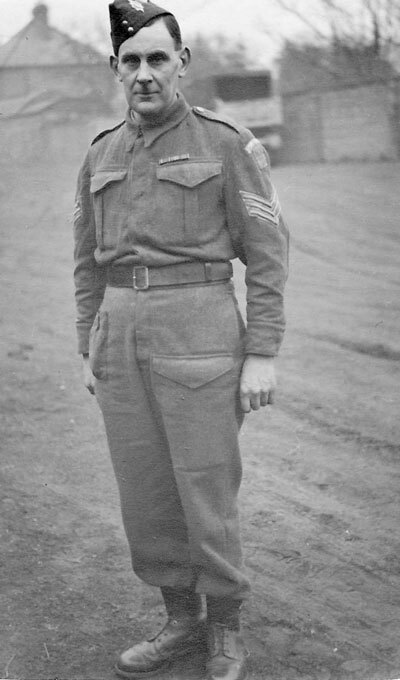 During the second World War Dad joined the Home Guard and was made a sergeant, presumably because of his previous army experience. I was born at the very end of the war. Then in about 1970, after I had left home, they moved to a council old people’s bungalow in Cedar Close, Stourport. Dad was 75 years of age when he finally retired, having given almost 60 years of service to his Company apart from his years in the Army. Dad’s main forms of relaxation were fishing, bowls and crib. He enjoyed these through Stourport pubs, including The Royal Oak, The Angel and The Tontine. 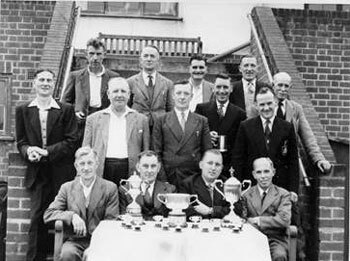 Here is a happy group (left) of memebers of the Old Anchor Bowling Club. In earlier days he had an allotment in Lickhill Road but must have given it up whilst I was still young. He suffered from bronchitis for a lot of his life, maybe as a result of the gas, and was in Kidderminster Hospital when Mom died in January 1989. He never returned home again and went to Astley House nursing home where he eventually died in July 1990 at the age of 93. Acknowledgement to "The Worcester Regiment in the Great War" by Capt. H F Stacke for some of the information in the above article. is gratefully made to David Burton for the above information about his father and his generous permission for its publication. Other information about the Home Guard in Worcestershire contained within this website can be seen in the Worcestershire summary page which can be accessed via the Mems-Worcs link below. Much information about the Home Guard in the county is also contained in the book Chronicles of the Worcestershire Home Guard by Mick Wilks (Logaston Press, 2014, ISBN-13: 978-1906663872). And if you can add anything to the history of the Worcestershire Home Guard, and especially the Stourport unit, please contact staffshomeguard via the Feedback link.